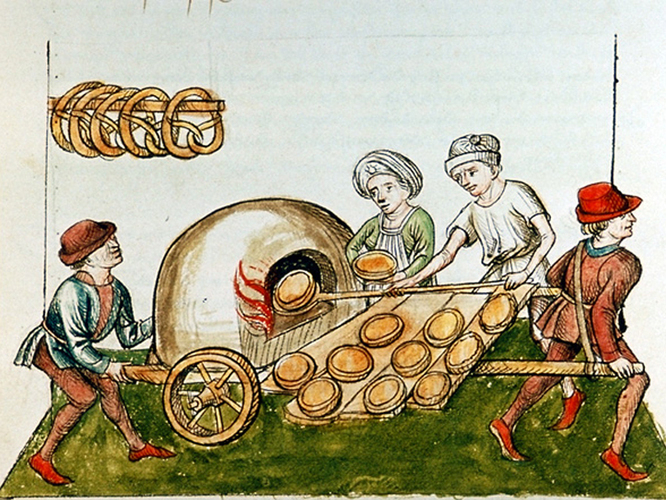 The production, processing, and consumption of foodstuffs were a primary preoccupation of the medieval population. In the earlier unsettled period, the production was strictly for the household; later, with the development of towns and more stable settlements, there was the growth of markets and trade in foodstuffs. Throughout the period, the most important social activity was eating in the company of others; usually this was family, but often it was lord and retainers. The ability of the overlord to maintain power was partially dependent on his ability to provide food for his large retinue of family, retainers, and servants. In fact, the title ‘lord’ is thought to be derived from the Old English ‘hlaford’, or ‘loaf’, signifying bread-keeper. The staple item of the medieval diet was some form of grain, usually made into bread; the poorest peasants would have eaten coarse, less desirable grains, such as oats, in the form of porridge or flat pancakes. The absence or presence of bread at a meal, and the degree of fineness of the flour, was indicative of social status and income. White bread was the most desirable because the wheat was ground fine and sieved for debris. Brown bread was made from rye or bran and was most widely consumed. The poorest quality was bread made from peas, beans or oats, called horse bread because it was commonly eaten by horses as well as by the poor. Bread occupied such an important place in the diet that towns enacted regulations to control its manufacture and sale by the bakers’ guilds. Dairy products made up another important segment of the diet. Both sheep’s and cow’s milk were used to make butter and cheese, which were heavily salted to aid in preservation, and which permitted trade in these products over longer distances. The curds, whey, and buttermilk residues left from cheese-making were all consumed as accompaniments to bread. Most rural households and estates kept chickens or ducks, both for food and eggs. Meat and fish were not regular fare for the poorer levels of society. Whereas in the earlier Middle Ages, wild game such as venison, boar and hare were readily available for hunting in the forests of Europe, the spread of cultivated land and the encroachment of settlements eventually cut off access to these animals; only the nobility were allowed to hunt them. Mutton, beef and pork (in descending order of popularity) were available to those who could afford them; professional butchers were often among the wealthiest burghers. Fish and eel, salted or fresh, became a mainstay of the medieval diet, because of the Church’s strong rules prohibiting meat at least one day (and initially three days) a week and during the entire Lenten period. Most households had gardens to grow vegetables such as cabbage, leeks, onion, beans and herbs. The herbs for flavouring, as most spices were rare and expensive 1. Monasteries and the large estates of the nobility usually had orchards for fruits, olives and nuts, and often incorporated vineyards. Wine was the drink of choice for the nobility, the clergy and the merchant class, and the trade in wine was one of the more important commercial enterprises. By the early 14th century, wine made up 30% of English imports from countries such as France and Spain. The rest of the population, however, seldom tasted wine. For them, ale, beer and mead sufficed. The brewing of ale began as a domestic activity for women, but expanded with the population into a guild-organised commercial category. 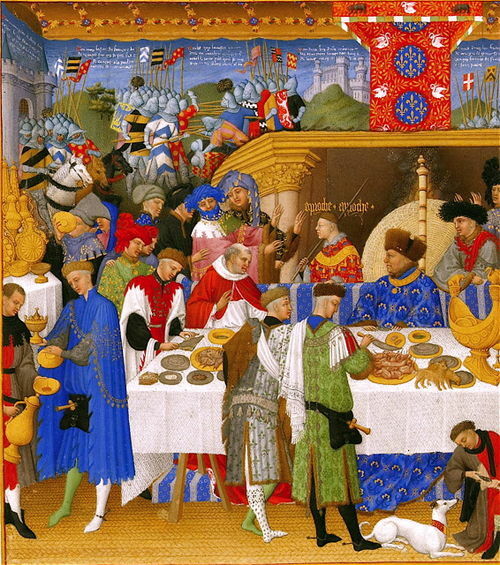 There was a great variety of food available, and this fact is most is most evident in the literary description of medieval feasts. Due to the pervasive influence of the Church, the calendar alternated constantly between fast and feast. 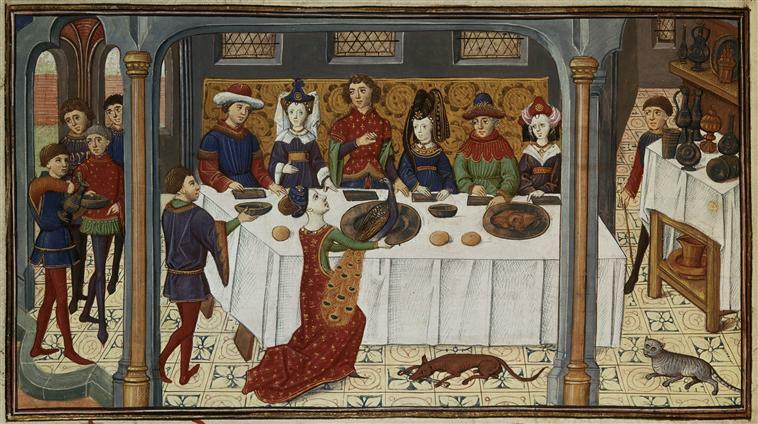 Although great variations in menu planning were probably not possible for most peasants, the wealthiest classes and the clergy could indulge in splendid banquets. These culinary celebrations varied in detail, but typically began with musicians playing while guests were seated at long tables in descending social order, with the host and most important figures, seated at a raised dais that placed them higher than the communal salt cellar (thus “above and salt”). The top of the first loaf was cut off by the servant and presented to the dais guests – hence the term “upper crust”. The rest of the bread loaves were cut into thick slices to create plates, or trenchers, for each guest, who shared bowls and knives. Food was eaten with the fingers, so a pre-meal ceremony of pouring water over each guest’s hands was performed. As the guests ate, holding the little finger extended in order to scoop up spices was considered a mark of good breeding. 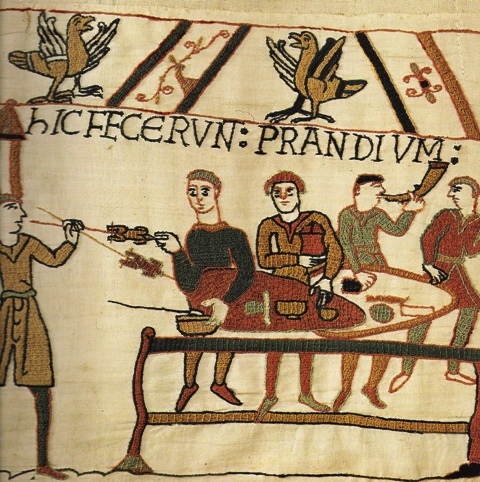 Participants in a feast of the earlier Middle Ages, particularly in German northern Europe, would have sat down to a meal heavy in fatty meats, but later a more refined and elaborate cuisine was offered. An artfully prepared array of dishes, including meat and game, fowl of every type (even crane and lark), and fish and shellfish, was served. Meats were roasted, fried, stewed, boiled and made into pies, and flavoured with countless herbs and costly spices. Fresh fruit and vegetables were boiled or preserved in pickling brine, or served with spices and honey. Sauces of various ingredients, including wine, cream, herbs and vinegar, flavoured many dishes. 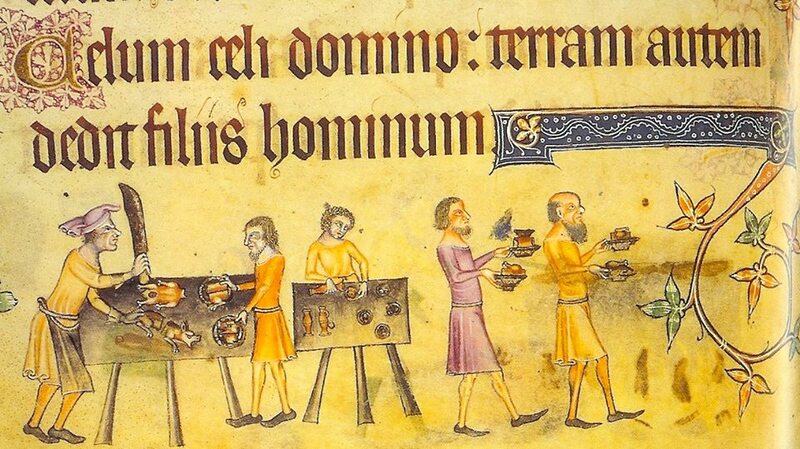 For the upper levels of society, the medieval kitchen provided endless delights – even religious fast days did not inconvenience unduly – but the poor remained grateful for their simple daily bread.